Featured at My Book, The Movie: Destined for Greatness: Passions, Dreams, and Aspirations in a College Music Town by Michael Ramirez. 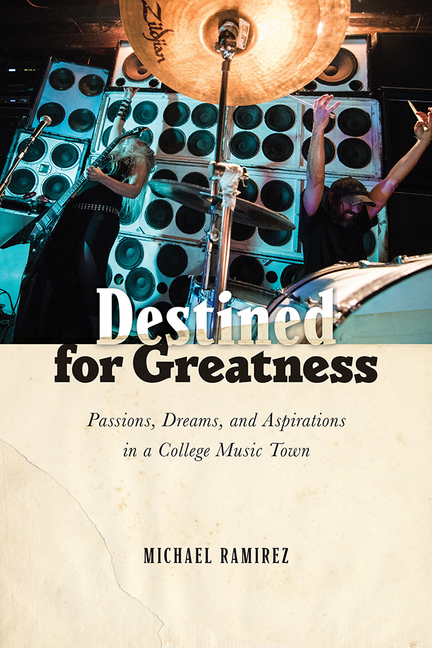 Destined for Greatness: Passions, Dreams, and Aspirations in a College Music Town is a sociological study of the life course pathways that lead some men and women to careers in rock music as they venture into adulthood. I interviewed nearly fifty musicians in the iconic college music town of Athens, Georgia for the book. While the musicians were a diverse population, they were all – every last one of them – consistent in the passion they had for music. Their pathways to music were varied. Some knew from an early age that music was "in their blood” and that music was their life calling. Others were “late bloomers” who didn't get the music bug until later in life. Destined for Greatness traces the ways musicians navigate music and creatively embed it in their lives, despite the trials of adulthood. The book is about more than music. It is about how the dreams we craft are shaped by larger social forces of gender, age, and culture. I could easily see my book adapted for the big screen. I am torn between two film versions of Destined for Greatness. Treatment one is the drama - almost a coming of age film in the vein of Thirteen or Boyhood. I imagine Richard Linklater would nail it (as he did with Dazed and Confused and Boyhood). He has a knack for painting the subtleties of adolescence and the larger experience of aging. Plus, he would ensure the best soundtrack for the film, as music is a core theme of much of Linklater’s work. The Page 99 Test: Destined for Greatness. My Book, The Movie: Destined for Greatness.